All our work is entirely dependent donations from our supporters. 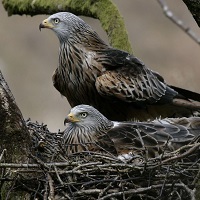 There are two ways to help fund the work of the Welsh Kite Trust, which will in turn help ensure the continued recovery of the red kite in Wales and carry out urgently needed research into other iconic raptor species such as kestrel and merlin, to help save them too. Make a regular donation to help us plan long-term conservation work. The day to day admin is managed by a group of volunteers and the vast majority of the fieldwork is unpaid, though where necessary, specialist ecologists are contracted. The Welsh Kite Trust works with very skilled volunteers who sometimes spend a considerable time in the field. By offering to reimburse expenses such as fuel costs, the Trust is able to collect high quality data which would not otherwise be achievable. The Trust also purchases materials for nest boxes and other equipment related to conservation and research.